Getting the policy commitments from government and money from investors to make them a reality is an entirely different matter. 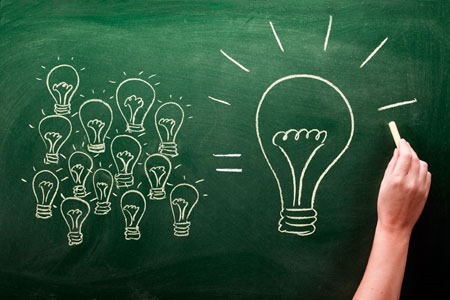 There is no shortage of good ideas for improving the prospects of conventional light water reactors, small modular reactors using similar technologies, and advanced reactors which have multiple technological roadmaps. The problem is that all of them are contending for investor funding, government R&D support, and licensing reform. The cruel fact of the matter is that no reactor vendor is going to get an order for one of their units from a utility unless they can prove the design is safe and can be operated at a profit. Success factors also include having a reliable supply chain that can meet NQA-1 standards, a skilled workforce to build the units, a common sense and cost sensitive regulatory environment, and trained operators to run the reactors once built. One of the reasons the Westinghouse projects in Georgia and South Carolina are in so much trouble is that after 30 years of benign neglect by the Department of Energy, none of these success factors were in place when the projects broke ground. How many undergraduate engineering students are going to switch out of the nuclear field after learning about the financial disaster visited on these projects by mismanagement at Toshiba and Westinghouse? There are multiple reasons for the decades of neglect of the nuclear industry, but two of them are that the green wing of the Democratic party favors solar and wind power due to their “lifestyle” appeal to voters and the Republican party, which has long since been captured by the oil and gas industry, sees nuclear energy as a competitive threat. However, now we are faced with scientific evidence that the earth is warming caused by increased CO2 emissions from fossil energy fuel combustion processes. To “decarbonize” the various energy using sectors of our economy will require a renewed commitment to nuclear energy. It makes no sense to put electric cars on the road if their power comes from coal-fired power plants. The executive branch of the federal government is ill-prepared for this challenge with the Department of Energy headed by former Texas Governor Rick Perry who famously said he wanted to eliminate DOE in a 2011 presidential debate but couldn’t remember its name. Unlike other recent secretaries of energy with PhDs, like Steven Chu, who held a Nobel Prize in physics, and Ernest Moniz, who led MIT nuclear energy programs, Perry has an undergraduate degree in animal husbandry. Perry’s campaign position is consistent with the ‘search & destroy’ profiles of other Trump cabinet appointments like Scott Pruitt at EPA who has made no bones about his plans to tear the agency apart. At Interior Ryan Zinke has made clear he intends to promote coal mining and natural gas drilling in direct contradiction of things like national park boundaries. Finally, many key posts at DOE remain unfilled by Perry. Taken together it is difficult if not impossible to see any hope of clarity regarding nuclear energy from the executive branch. Congress may be a source of support, but without a viable agency to execute programs with their funding in place, it may be the U.S. nuclear energy industry is facing a dark and uncertain future at least where the federal government is concerned. The problem is similarly acute in the UK where a precipitous drive to exit from relationships with the European Union is turning relationships with Euratom on its head. That said people are speaking up. Here are a series of brief summary reports of industry views on what needs to be done to put the nuclear energy industry in the US and the UK in gear to address the challenge of decarbonization of our energy use. A country’s nuclear energy expertise is a significant element of its geopolitical influence and, along with other clean energy technologies, is essential to meeting global clean energy demands and addressing climate challenges, the Global Nexus Initiative (GNI) says in its fourth and final policy memo. The expansion of nuclear development outside the United States and Europe is shifting influence toward nations that have not been known as leaders in nuclear governance, like Russia and China. Traditional nuclear leaders like the United States and its allies must bolster their role as nuclear suppliers in order to continue influencing regulatory and security norms, the report states. Kenneth Luongo, president of the Partnership for Global Security (PGS) discussed U.S. position at a press conference in Washington, D.C. 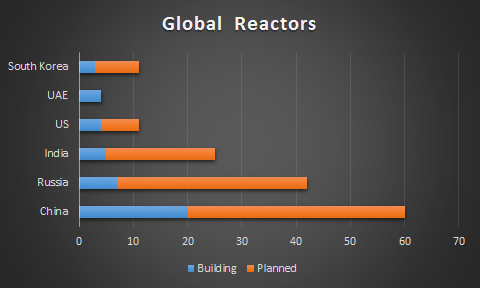 Chart Notes: For the US, the three planned nuclear reactors are far from done deals. They are DTE’s Fermi III, Dominion’s North Anna III, and Duke’s William States Lee plants. All have received NRC licenses. However, given the financial troubles faced by reactors now under construction in Georgia and South Carolina, it could be a long time before any other utility in the U.S. decides to proceed with a full size nuclear reactor regardless of the vendor. India’s commitments are problematic since 12 of the 20 planned units are supposed to be supplied by Areva and Westinghouse, and neither vendor is anywhere near able to break ground. GNI also recommends that the current framework of governance evolve into one that is forward-looking and can handle the particular challenges that the next few decades will present, including effectively involving newcomer nations, guiding emerging suppliers and combating climate change. The think tank said in its statement that traditional nuclear suppliers … have primarily written the current rules. But they are in the process of losing ground on nuclear commerce to Russia and soon China. These are very serious issues for the entire global community. Nuclear operation and supply are special responsibilities. And, radiation does not respect borders. Standards must be strong. “An aggressive and effective response to these new realities—strengthening, unifying, and when necessary, expanding the nuclear governance system—is essential for nuclear power to continue to play a vital role in meeting the increasing global need for carbon-free energy in the 21st Century,” GNI says. Part of this effort will involve not only developing and deploying advanced reactor technology, but also working to preserve the current nuclear plants. “To increase its market share and thereby preserve its ability to shape the global use of nuclear technology, the United States must have both a strong domestic nuclear power program and an aggressive nuclear trade and export program,” NEI President and Chief Executive Officer Maria Korsnick said at the conference. To achieve these goals, GNI recommends the development of diverse coalitions that include governments, international institutions, the industry, nonproliferation experts, environmental specialists and other stakeholders. As a joint project of the Nuclear Energy Institute and PGS that drew together a diverse range of experts, GNI is a positive example of what these innovative partnerships can do. (NucNet) The US nuclear industry has called for the Nuclear Regulatory Commission’s “outdated and costly” regulatory regime to be updated. In testimony to the House appropriations committee’s energy and water development subcommittee on May 3, 2017. Nuclear Energy Institute president and chief executive officer Maria Korsnick said the need for Congressional action on regulatory reform has become more urgent as utilities consider using accident tolerant fuel and NRC applications are being submitted for certification of small modular reactor designs, which will be deployed in the mid-2020s. She said developers of advanced non-light-water reactors are beginning to deal with the NRC as they look to deploy their technologies around 2030. She said the industry wanted an urgent review of accident tolerant fuel and advanced reactor programs, and funding for federal research and development efforts that promote new technologies and innovation. (NucNet) The UK should focus on developing small modular reactors (SMRs) to secure the country’s nuclear industry post-Brexit, according to a report by the Institution of Mechanical Engineers (IME). The report says SMRs could present the UK with export opportunities and return the country to the international nuclear reactor supply arena. The report outlines possible routes the government could take to leaving the European Atomic Energy Community (Euratom) regarding issues such as safeguards, nuclear cooperation agreements, research and development, and regulation. The IME is calling for the UK to develop its own safeguarding office, to ensure the country conforms to international rules on safety and non-proliferation, but says the UK should remain an associate member of Euratom for the specific purpose of R&D. Jenifer Baxter, head of energy and environment for the IME and lead author of the report, said in a May 5, 2017 statement that the UK’s departure from the EU and Euratom is likely to be “complicated and difficult”, but it also presents the country with an opportunity to “reshape its nuclear industry and once again become a world-leading innovator in nuclear technology”. (NucNet) French state-owned utility EDF hopes for UK-style subsidies for the construction of new nuclear plants in France and expects that president-elect Emmanuel Macron’s plan to reduce the share of nuclear in the French power mix is a “long-term” plan. 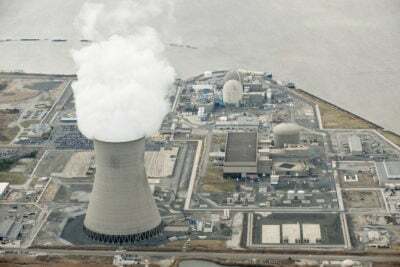 EDF chief financial officer Xavier Girre said EDF was hoping to convince the Macron government to introduce state subsidies for new nuclear plants, modelled on the contracts for difference (CfD) scheme under which EDF is planning to build two EPR nuclear units at Hinkley Point in England. EDF has signed a CfD with the British government under which it can sell power at £92.5/MWh for 35 years. The Hinkley Point project will cost £18bn (€21bn, $23bn). If the market price is above that level, EDF refunds the difference, if it is below that level it receives a top-up. According to the World Nuclear Association, France has 58 nuclear reactors operated by Electricite de France (EdF), with a total capacity of 63.2 GWe, supplying 436 TWh of electricity in 2014, 77.5% of the total generated there (IEA data). The problem France faces is that starting in 2021 32 of its 58 operating reactors will begin to hit the 40 year mark. 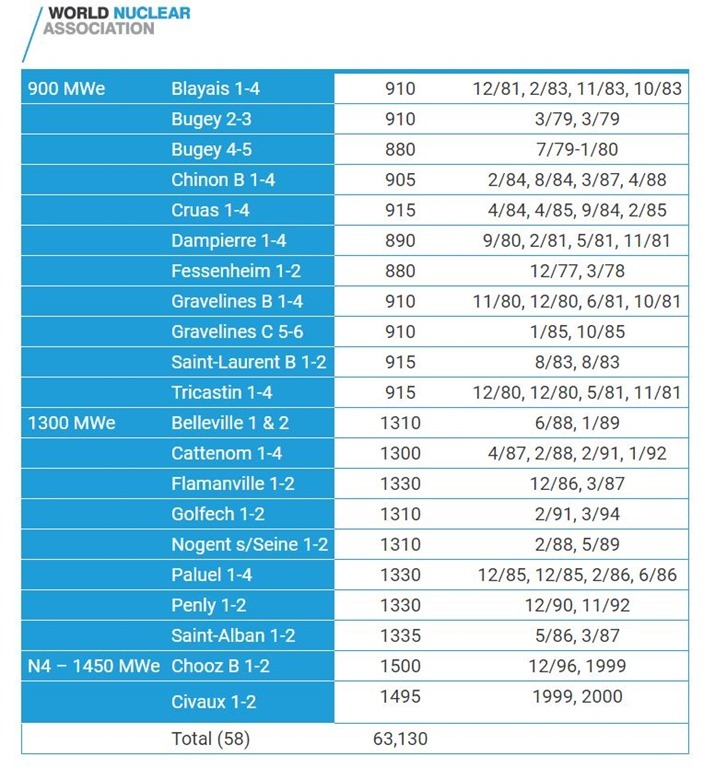 The end of the the 2020s, all of France’s older 900 MW units will be 40 years old. Planning an affordable succession for these units is a major challenge that must be met starting now. Mr Girre said EDF also wanted to talk to the new government about the ARENH (‘Regulated Access to Incumbent Nuclear Electricity’) mechanism under which currently it is forced to sell up to 25% of its nuclear output to competitors as part of measures to improve competition in the retail power market. “We consider that it is necessary and fair to reform the ARENH mechanism to prevent it from being as biased as it is today,” he said. While wind & solar will then cost ~£50/MWh, decreasing further…. 2- France has about the highest costs of electricity in Europe. Which is reflected in the about the highest whole sale prices. Check page 10 of the last EU report. They have the about lowest consumer prices because France hardly tax electricity, while EU countries normally double the costs for consumers by various taxes. As nuclear is 2 – 5 times more expensive than wind & solar incl. storage, is will delay the de-carbonization, as nuclear takes so much money away and gives so little in return! Even the construction of new nuclear takes already 5-20 times more months! That nuclear is 2 -5 times more expensive also implies that it emits 2 – 5 times more CO2 per MWh produced.